Cloudy skies early, followed by partial clearing. Low 42F. Winds SSW at 10 to 15 mph. 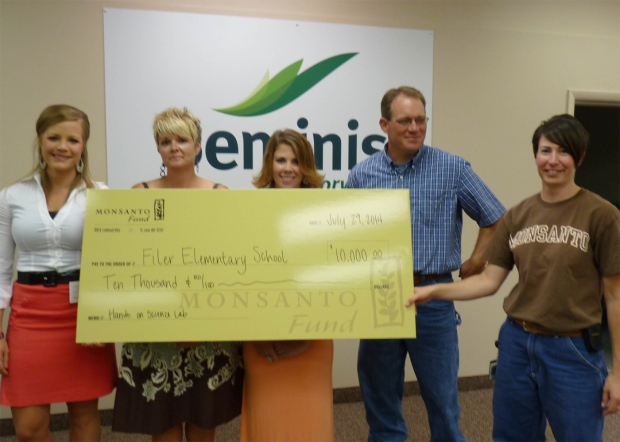 The Filer School District has received a $10,000 grant from Monsanto. Shown left to right: LeeAnn Morgan, teacher, grant author; Gretchen Esson, 6th grade teacher; Sheena Kelsey, 3rd grade teacher; Matt Mahannah, school principal); and Robyn Walton, bean research assistant at Seminis/Monsanto Co.
SCCAP’s CEO Ken Robinette, Housing Facilitator Jill Sprinkle and Board Vice Chariman Joe Herring received a check from Wells Fargo Bank’s Shane Hamblin, Gita Latterman and Jerry Olson. Diamond Line Delivery System services the Pacific Northwest. South Central Community Action Partnership (SCCAP) would like to thank McDonald’s and the Kyle Family for hosting McCash for Kids. SCCAP was presented with a $2,000 check that will be used to provide school supplies to children of the Magic Valley. Pictured, left to right: Janice Degner, Bill Kyle, Donna Kyle, Jennifer Hudson (front), Darren Kyle, Shawnee Powers, Brad Weiser (back), Ken Robinette, Nate Bird (back) and Jackie Walker. For those who submit announcements for the Times-News business section, please include the full name, location and telephone number of your business. Submissions with incomplete information might not be published. Please send all details you would like us to consider to egoodell@magicvalley.com. FILER • The Filer School District is launching an after-school program focused on hands-on learning and supported by a new science lab, thanks in part to a $10,000 grant from the Monsanto Fund, as part of its 2014 site grant initiative. Over the past few years, the district has developed a strong relationship with employees at the Filer Monsanto plant. Many employees live in Filer and graduated from the district. Monsanto and district employees recognize the importance of education for their small town and want to provide opportunities for students to make positive contributions to the community. The grant money will pay for lab equipment and materials for activities and science experiments, such as creating volcanoes and rockets. The lab is intended to teach students skills and how to work together to solve problems. Overall, the district wants to transform the classroom, moving away from students reading textbooks while sitting at desks and toward a collaborative problem-solving environment at new lab tables. TWIN FALLS • Employees of Tripp Family Medicine, Twin Falls, have completed the two-day Worker’s Compensation class offered by the state Industrial Commission. Dr. Jonathan Tripp, D.O., Russell Singleton, P.A., Tricia Tripp, office manager, and Shellien Gilliland, office assistant, each has been state-certified. Tripp Family Medicine now offers commercial worker’s compensation and occupational health services. Body Balance Therapist Certified in P.T. TWIN FALLS • David B. Hutchinson, PT, MPT, OCS, recently became a board-certified orthopaedic physical therapist, Body Balance Physical Therapy has announced. Hutchinson is the only physical therapist in Twin Falls listed by the American Board of Physical Therapy Specialties to have achieved board certification in Orthopaedic Physical Therapy. Orthopaedic physical therapists diagnose, manage and treat disorders and injuries of the musculoskeletal system (muscles, bones, joints, bursa, ligaments and tendons) and other types of care. Contact Body Balance Physical Therapy at 208-736-9011 or 208-934-9011. 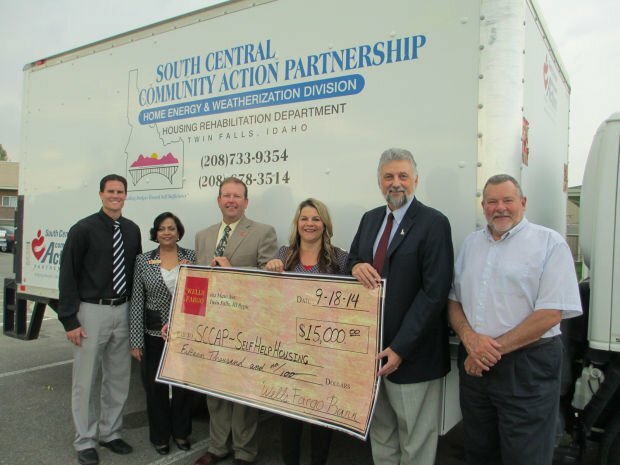 TWIN FALLS • Wells Fargo Bank recently donated $17,500 to the South Central Community Action Partnership for its Self Help Housing Program. The money will help with household operating expenses. Under Self Help Housing, seven to 10 families unite to build their own homes under the guidance of a construction supervisor employed by SCCAP. They build 65 percent of the houses themselves by committing 35 hours a week with friend and family volunteers. By putting in the “sweat equity,” the families don’t have to make down payments and move into their homes with an instant equity of $20,000 to $25,000. USDA Rural Development provides the loans to qualifying families with interest as low as 1 percent. TWIN FALLS • Diamond Line Delivery System Inc., at 223 Deer Ave., recently held a ribbon cutting with the Twin Falls Area Chamber’s Ambassadors. Diamond Line Delivery System Inc. is a new member of the chamber. The “less than truckload (LTL) carrier serves the Pacific Northwest with professionally trained drivers. The company is known as a destination end carrier with overnight service to major cities in the Pacific Northwest. Reach Diamond Line at 208-733-6375. TWIN FALLS • Six advanced-model sewing machines will be donated to a refugee sewing class by the Twin Falls Sewing Center in with the manufacturer of Baby Lock sewing machines. Owner Larry Himple recently returned from a convention for sewing retailers in Las Vegas, where Baby Lock agreed to donate three machines. Twin Falls Sewing Center will donate three more to the class offered at the Twin Falls Reformed Church. Ernestine Osborne and other volunteer instructors teach the class to refugee families whose lives have been ravaged by war, political upheaval, violence, tragedy and famine. As these families struggle to find jobs and learn English, the free class teaches 16 basic stitches to create, mend and alter their clothing. The class now has 10 to 15 refugees, mostly women, and four instructors.